Hazel Burke (Shirley Booth) is the wonderful maid for the Baxters. Lawyer George Baxter (Don DeFore) and his lovely wife Dorothy (Whitney Blake) have a son Harold (Bobby Buntrock). Rosie (Maudie Prickett) is a maid and a friend of Hazel's. Harvey Griffin (Howard Smith) is a demanding client of George's. George's sister, Deidre (Cathy Lewis) is married to Harry Thompson (Robert P. Lieb). When the show went to CBS, George and Dorothy were tranferred to the Middle East. George's brother Steve (Ray Fulmer), his wife Barbara (Lynn Borden) and their daughter Susie (Julia Benjamin) joined the show. Hazel and Harold lived with Steve's family. 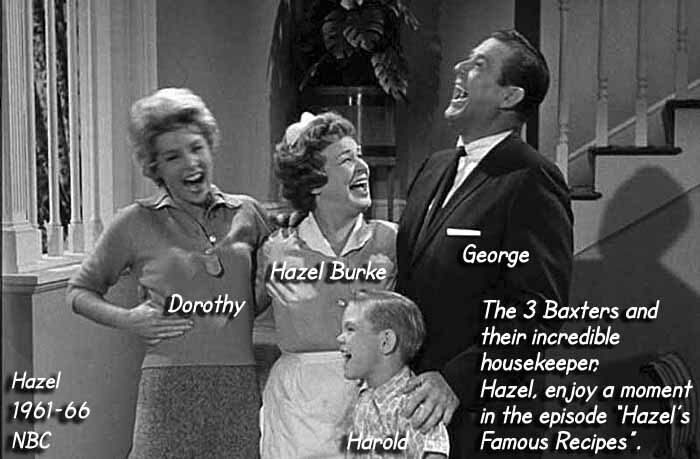 Live-in maid Hazel has a life, and it is a great one with the Baxters, George, Dorothy, and their son, Harold. They all like each other and have an incredible life together. Hazel is an excellent maid. She does not need a clear-cut job description because working for the Baxters is more than just a job. It's a life that she enjoys. A maid should get the same respect as anybody else. And that person should have a voice in issues just like anybody else. A job does not have to a drudgery with the boss playing the control game. To the Baxters, Hazel is more than just a maid. She's a treasure that they are glad to have. Hazel's charm extends beyond the Baxter household. Deidre, George Baxter's sister, has an attitude about Hazel. And between the two, it's obvious who comes up short. Hazel is a great show with a wonderful blend of characters that is really something special. I like "Hazel" very much but I did not like the episode, "Hazel Quits", (4/19/62). I like memories and old fashioned sentiment and this episode was constructed to be against those things. Old fashioned sentiment is one of the reasons I watch "Hazel" in the first place. A Mr. Wheeler plans to buy lake property from the city, drain the lake, and build an electronics plant there. The city council is holding up the sale. Mr. Wheeler has another appointment with city council and he wants George to be there. Some think Rainbow Lake should be preserved for the people. George said, it's an old story, old fashioned sentiment trying to block progress ... well if old fashioned sentiment always won those fights, we'd still be driving horse and buggies. On television, Hazel speaks out against Mr. Wheeler trying to buy the Rainbow Lake to fill it in. This causes a problem for George, since he represents Mr. Wheeler. So, does time run out for memories?